Thomas Garrett has been the United States Representative for Virginia's 5th congressional district since 2017. Tom Garrett is not running for reelection. He is a member of the Republican Party. 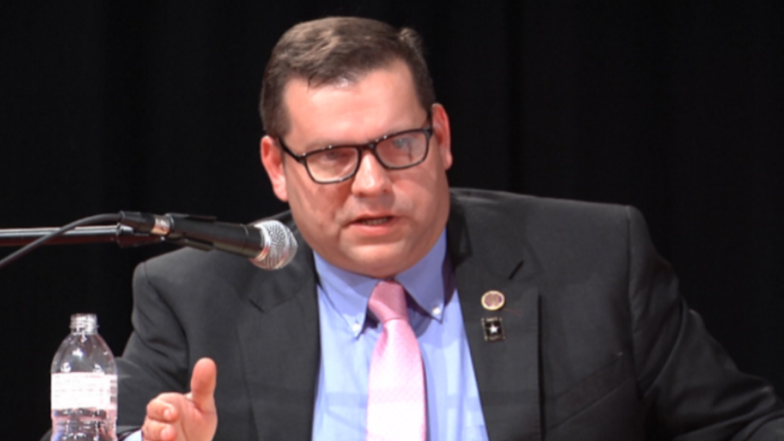 Tom Garrett in 2016 was elected to represent Virginia’s Fifth Congressional District. He earned his Bachelor’s and Juris Doctor from the University of Richmond. Tom was in Army ROTC as an undergraduate at Richmond, and was commissioned as a 2nd Lieutenant in the United States Army upon graduating. He served on Active Duty as an Artillery Officer for six years. His service took him overseas to Germany, and Bosnia and Herzegovina, where he led as a Brigade Operations Officer in Operations Joint Guard and Joint Endeavor. Through his armed service career, Tom sharpened his leadership skills fighting side-by-side with brave American soldiers, and defended the Constitutional rights we hold dear. Tom entered public service as a civilian in 2007 when he was elected to the Office of Commonwealth’s Attorney in Louisa County. In 2011 he ran for Virginia State Senate where he served until 2017. During his service representing the Twenty-second Senatorial District in the Virginia General Assembly, Tom worked tirelessly to promote job growth and strengthen economic development. As Congressman, Tom will be working to advance Constitutional principles, reign in reckless spending, improve education initiatives for our students, and put the safety and security of this Nation above all else. Tom has been recognized with a number of awards including: 2012 Freshman Legislator of the Year (Virginia Chamber of Commerce), 2013 Defender of Liberty (American Conservative Union), 2014 Legislator of the Year (Virginia Chamber of Commerce), 2014 Champion of Justice (Virginia Association of Commonwealths Attorneys), and a 2015 Defender of Liberty (American Conservative Union). Tom was named to the House Committees on Homeland Security, Foreign Affairs, and Education and the Workforce for the 115th Congress. He was appointed to serve on a highly-selective, Classified Task Force for the Committee on Homeland Security. He is the only Freshman member to be appointed to serve on a Joint Task Force to tackle Health Care and Interstate Health Insurance. Tom lives in Buckingham County with his wife Flanna and, newborn daughter, Sheridan Locke Garrett. On May 28, 2018, Garrett announced that he is an alcoholic and said he wouldn’t seek reelection to his seat in the 2018 elections.